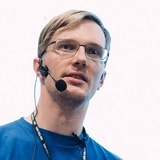 Dmitry Jemerov is a long-time IntelliJ IDEA developer and one of the earliest contributors to Kotlin. Currently he is leading the Kotlin tooling team. Dmitry is also a co-author of the "Kotlin in Action" book.